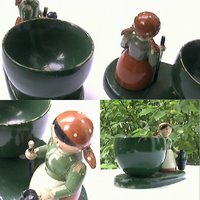 Figural wooden egg cups were born quite a longtime before the now more popular figural plastic egg cups. 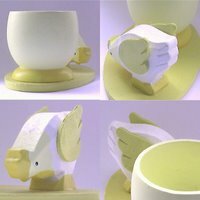 Easy to manufacture — especially since machines can make them—, shock-resistant and light weighted, they are not only very common as children egg cups, but also as souvenir pieces. 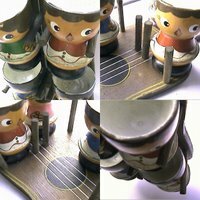 Details on the selected figural wooden egg cups: 1) German egg cups, probably from the 1950s [eggcup3439]; 2) marked "Erzgebirgische Volkskunst: Expertic, Made in German Democratic Republic" [eggcup0879]; 3) signed by Cecilia Brugge [eggcup2378]; 4) bought in Belgium in 2000 [eggcup1153]; 5) 4 egg cups on guitar-shaped plate [eggcup0928]. 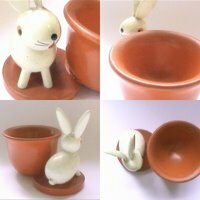 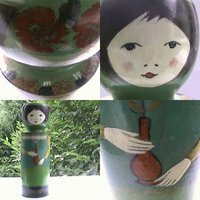 If you like wooden egg cups, don't forget to check the Non-figural wooden egg cups post.